AlarmPad 1.8.2 is an all new alarm clock that brings context to your alarms. 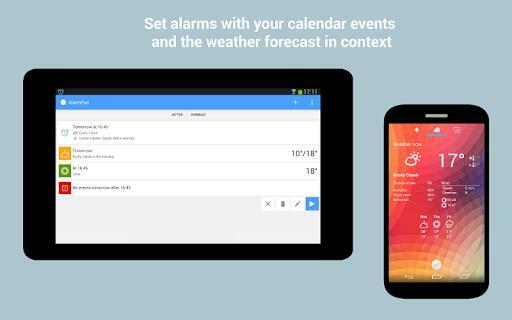 When your alarm rings, it will display the weather forecast, your calendar appointments, and much more. AlarmPad is very customizable, and you can install third-party extensions to teach it new tricks. Some features in the free version must be unlocked before you can use them. These include the server backup and synchronization, the use of playlists and NFC tags, and the extra ringtones. You can unlock them for free by inviting your friends using the coupon code you will receive after registering with us. You can also unlock only the features you want with an in-app purchase. The free version is also ad-supported. Ads only have access to your Internet connection to display them and estimate your country/city location.To remove these limits and ads, please consider buying the pro version.